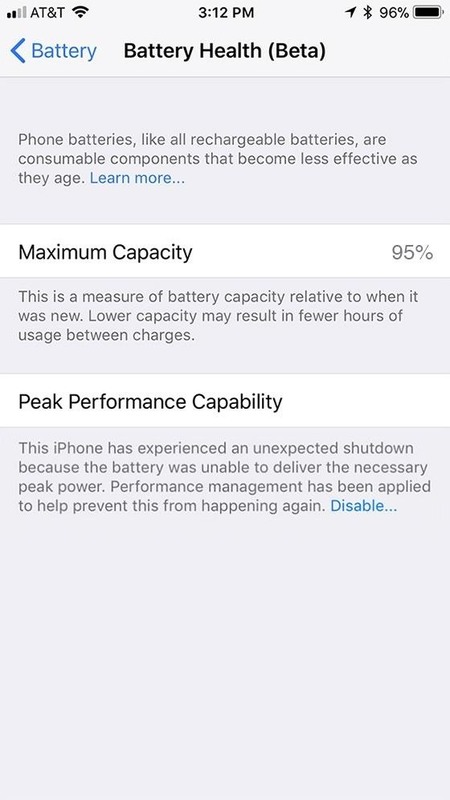 Before, the only way to really tell how your iPhone's lithium-ion battery was performing was to use tools such as Geekbench and Battery Life, but now Apple has included some quick battery health checks right into iOS 11. This feature is only available starting in iOS 11.3, so make sure you updated your iPhone to take advantage. 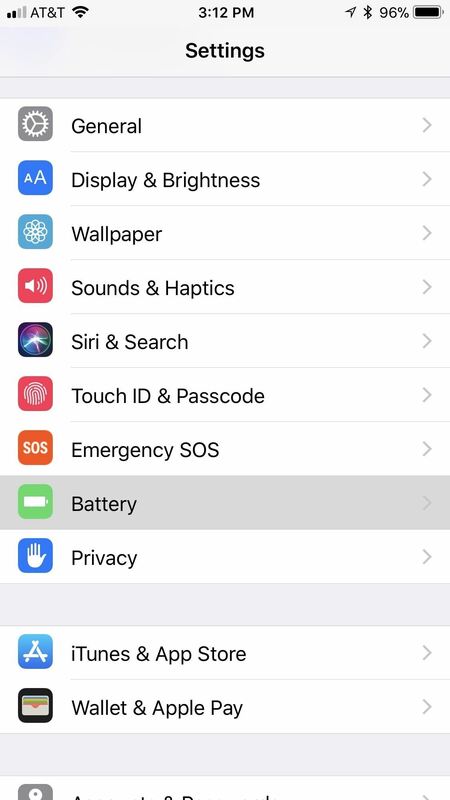 Once you're running iOS 11.3, in order to see your iPhone battery's health data, go to "Battery" in the Settings app. 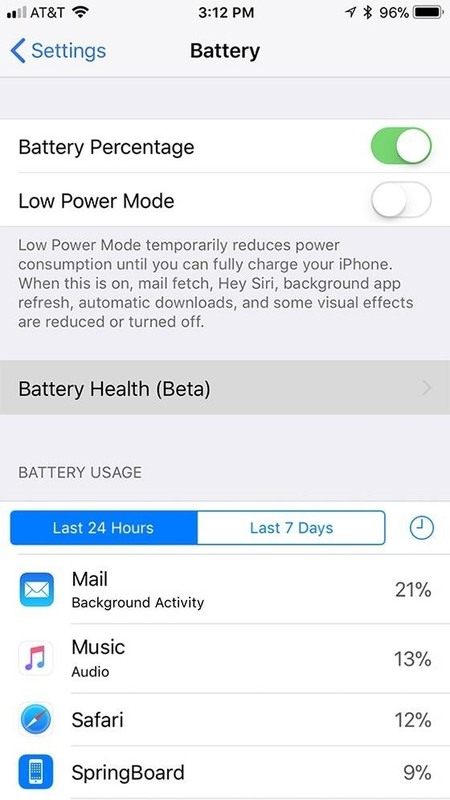 You'll still be able to see the "Battery Percentage" and "Low Power Mode" toggles, as well the Battery Usage statistics that have been around since iOS 8. However, a new "Battery Health (Beta)" option will be available for you to dive into. After tapping on "Battery Health (Beta)," you'll see two new data points called Maximum Capacity and Peak Performance Capability, which we'll explain in more detail below. When you first buy an iPhone or get a new battery, the percentage next to this option will read 100 percent. As the lithium-ion battery chemically ages, it will have a lower capacity when compared to new batteries. So, if your battery is reading 91%, you will probably have to charge your iPhone more frequently than you did when your battery was reading 100 percent. As lithium-ion batteries chemically age, the amount of charge they can hold diminishes, resulting in shorter amounts of time before a device needs to be recharged. This can be referred to as the battery's maximum capacity—the measure of battery capacity relative to when it was new. Apple claims that their batteries are designed to hold about 80% of their original capacity when 500 complete charge cycles have occurred under normal operating conditions (abnormal conditions include things such as extreme temperatures). A complete charge cycle is when you've used an amount of juice equal to 100% of your battery's capacity, which is unlikely to happen in one day. 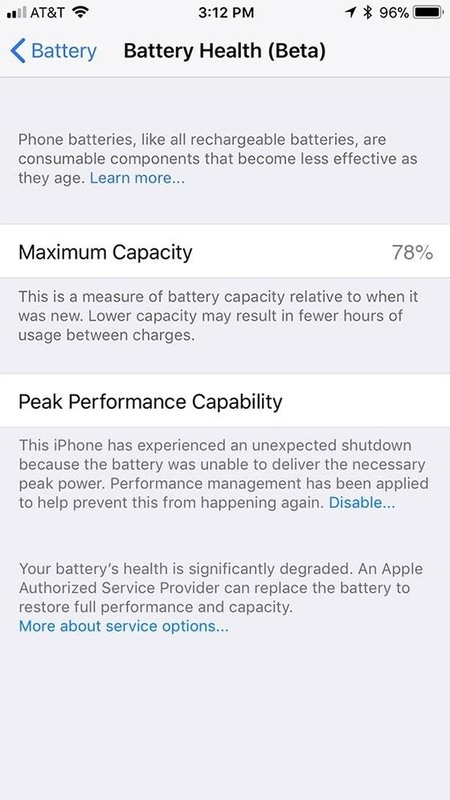 If the number you see in the battery health tool is below 80% and it's been less than one year since you've purchased the iPhone, you can have your battery service free of charge since it's still under Apple's one-year warranty. If it's past that one year, you will have to pay to have your battery serviced unless you have AppleCare+, which extends that warranty to two years. For those caught up in the performance-throttling fiasco, you can have your battery replaced for less than the normal cost without any warranty. If your iPhone's battery does dip below the 80% threshold, it will give you the following message at the bottom of the "Battery Health (Beta)" page. Your battery is still fine as is, but your iPhone will run better with a newer battery. When your Li-ion battery has degraded, it will be unable to deliver "peak power," i.e., the maximum instantaneous performance, to the iPhone at the same rate as when new. When the battery chemically ages, whether or not it's below 80% capacity or not, its impedance may become too high, resulting in a drop in voltage and the inability to continually power up the electronics in your iPhone. This is the issue that has been causing some iPhones to unexpectedly shut down. A low battery state of charge or cold temperatures can also cause these issues. This what Apple's power management system is for. When it realizes the battery is no longer strong enough to provide instantaneous power to all of the iPhone's innards, it will enable "power management protections" that dynamically manage the peak power so that the device will no longer shut down without warning. Of course, this causes the iPhone to lag, become dimmer, less loud, among other problems. This performance management works by looking at a combination of the device temperature, battery state of charge, and battery impedance. Only if these variables require it, iOS will dynamically manage the maximum performance of some system components, such as the CPU and GPU, in order to prevent unexpected shutdowns. As a result, the device workloads will self-balance, allowing a smoother distribution of system tasks, rather than larger, quick spikes of performance all at once. You can tap the "Disable" link to turn off any throttling that is occurring, but if the iPhone should unexpectedly shut down again, performance management protections will be re-enabled automatically. There is no way to turn throttling back on manually, so you'll just have to wait until it unexpectedly shuts down again for it to automatically turn back on. If that's the scenario, it's time to start thinking about getting a new battery for your iPhone. While these two new battery health tools in iOS 11.3 help determine when you need to have your battery replaced or serviced, you're still better of getting more advanced data from apps such as Geekbench, Performance Benchmark, and Battery Life. But if you don't want to deal with any additional tools, use this new data from Apple in conjunction with Battery Usage statistics to see what kind of apps are hurting your battery most.